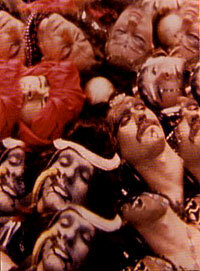 The Invasion of Thunderbolt Pagoda is a 20-minute art film directed by Ira Cohen in 1968. It features a bit of straightforward footage that alternates with a whole lot of trippy, twisted mylar reflection and split screen techniques. The stars of this show are grotesquely attired humans who are completely covered in outlandish, over-the-top, Eastern-inspired costumes, make-up and masks. As they writhe around in a seething fairytale opium den full of equally bizarre and intricate backdrops and surroundings, these troubadours of the visual cortex blow bubbles, taste butterflies, light up opium pipes with a demonic candle and dance the day away in a most surreal way. And when the mylar scenes kick in, the proceedings explode into infinite kaleidoscopic dimensions of hyper-reality. It’s breathtaking and breathgiving all at once. And it looks not so much like it was filmed in the ’60s, but rather some sort of strange, eternal dream state. You are currently browsing the archives for the Ira Cohen category.